New stamps have been issued by the Israel Postal Authority in 2010, depicting settling the Arava desert and honoring Holocaust Remembrance Day. E-mail, fax, scanning and syncing and other avenues of digital information transfer may have taken the communications by storm, but ordinary letters abound. And in Israel, beautiful stamps are created every month to adorn them. In 2009, 17 collections featured 53 new philatelic issues from the Israel Postal Authority. Collections included Fruits of Israel, the Tel Aviv Centennial, Israeli Music, Maritime Archaeology in Israel, and Honey in Israel. Since the beginning of 2010, seven new stamps have already been issued. One commemorates fifty years of settling the Arava desert, one honors International Holocaust Rememberance Day, one celebrates the 150th anniversary of the Alliance Israélite Universelle (an organization founded in Paris to protect Jewish human rights and promote education), one remembers the 50th anniversary of the Lions Club in Israel, and three feature birds of Israel. This stamp is called "Past and Future in our Hands", and was issued for International Holocaust Remembrance Day. The photograph, depicting the hand and arm of a very young child atop the hand an arm of an elderly Holocaust survivor, was taken by Karen Gillerman-Harel. It won the "My Flag" photo contest marking Israel's 60th anniversary. The stamp sheet features a quote by Eli Wiesel, noted Holocaust survivor and Nobel Peace Prize winner: "Remember the past for the sake of the future and may the past of the old not become the future of the young." This stamp is entitled "Alliance Israélite Universelle 150th Anniversary". Following a series of anti-Semitic events in France, Parisian Jews founded the organization in 1860 to provide diplomatic assistance to Jews, also founding hundreds of Jewish schools. Alliance established the famous "Mikve Israel" agricultural school in Holon, in front of which was taken a famous picture of Zionist visionary Theodore Herzl and German Emperor Wilhelm II in 1898. The stamp features a picture of Mikve Israel, a group of gymnasts and scouts at the Alliance school in Teheran in 1936, and the upper section of the Alliance "Torah Umelachah" school in Jerusalem. The First Day cover also features an Alliance student in Tunisia with a chalkboard covered in Hebrew, Arabic, and French. This stamp celebrates "Fifty Years of Settling the Arava". The Central Arava and Eilot Regional Councils cover approximately 17% of Israel, yet have only 7,000 residents in 20 residential communities, kibbutzim, agricultural moshav communities, and rural outposts. Agriculture, tourism, services and industry constitute the main profitable enterprises in the area. The region is known for dates, peppers, and other crops, but is particularly famous for the Yotvata Dairy. Approximately 60% of Israel's vegetable exports, 10% of the country's cut flowers, and 90% of Israel's ornamental fish come from the Arava. Timna Valley Park features prehistoric rock carvings, as well as some of the world's oldest copper mines, attributed to King Solomon, who turned the area into a center of copper production in biblical times. 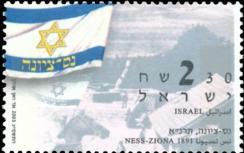 Pictures of Israeli stamps dating back to January 2000 are available at the Israel Post website, www.israelpost.co.il.